Stories for Boys Who Dare to Be Different, a Great Book! I am super excited about this book, from the folks who brought you the Rebel Girls books. Stories for Boys Who Dare to Be Different, by Ben Brooks and illustrated by Quinton Wintor. The sample story in the photograph is about Daniel Anthony, whose daughter told him they weren’t teaching her long division, because her teacher refused to teach it to girls. Her father opened a school where everyone could learn everything and his daughter grew up to be Susan B. Anthony! I’ve heard this story before, but never in the context of a father being a good role model for standing up for his daughter and her right to learn. This and so many more great stories in this book, a must buy for all the boys and girls in your life! And of course, not all the stories are in the context of being a father. There’s a wide range of stories of men being recognized for things they’re not normally recognized for. There are a ton of books like this for girls (which is great) and I’m so glad that there is finally one for boys too! Why no direct link to an online store to buy this book? 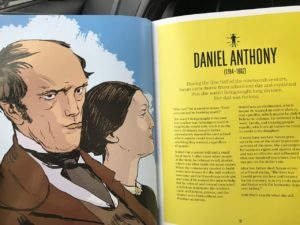 We’ve decided not to have affiliate links (where commissions can be earned) on this website, even though we’re going to recommend a ton of books! We hope you find these great books at your library or buy them at your favorite bookstore! 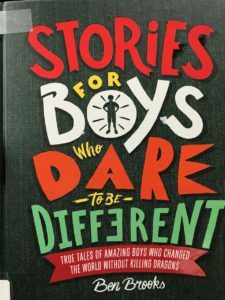 Stories for Boys Who Dare to Be Different, by Ben Brooks and illustrated by Quinton Wintor.